When designing a contemporary garden, it is a good idea to consider every space that you have available. Even in modestly sized gardens, there is usually plenty of upward space that you can exploit. Structures can be put in place to break up a garden into separate zones with distinctive looks and offer an ambience of their own. For example, a play area or planted border would usually take a different character from a seating area or outdoor kitchen. When planning a garden, try to think about it like decorating your home, with color schemes and individual identities for each room. Apply the same logic to each space, or 'room', in your garden. When setting out a seating area, try to keep the space distinct from the rest of the garden. An open terrace may mean that you get an uninterrupted view over the rest of your garden, but consider marking out the space with a low wall or a box hedge to give a patio its own sense of spatial identity. In addition, many American homes can benefit from a shaded area for seating, certainly in the summer months. Consider patios that are enclosed with a trellis which will allow dappled shade to be created by judicious planting. Alternatively, a sense of space can be created by something as simple as an adjustable awning which extends from your home over a patio to enclose it from above. If you are looking for a multi-function space which can be opened or closed, depending on how many people are over enjoying your garden, then opt for large planters which can be shifted around, perhaps on caster wheels, so that the size of the 'room' can be altered at will. One of the simplest ways of defining a room space in a garden is to install a pergola. A simple structure with an open design that allows you to see through it and beyond, they are ideal places for growing climbing plants, such as clematis and rambling roses. In addition, they are great for placing seating, perhaps at the far end of your garden so you can look back at your home, thus reversing your usual view. In addition, pergolas offer a place of destination. If your garden is an open patch, then cutting it up into sections with trees and hedges makes it seem larger and something worth exploring. A simple pergola can make for a great focal point in a garden split up in this way. Few architectural elements speak of American gardens more than the humble porch. Offering shade close to the home, a porch is the ideal place to hang out and read a book or enjoy a drink while looking out over your horticultural efforts. Rather than setting yours out with a traditional swing seat, why not opt for something a bit more contemporary? These days, garden designers increasingly use porches for hammocks and bean bag seating. In addition, your porch will integrate into the rest of the garden much more with the addition of a few pot plants and creepers which are allowed to grown through its structure. External kitchens offer hosts so much more than a simple barbecue set up. An external oven, perhaps for cooking pizzas in over a wood fire, provides many more culinary options than a smoker or a griddle. However, the real ability to cook outside is offered by the other elements of a kitchen which can be incorporated into outdoor settings nowadays. Running water and a sink allows you to cater for guests without needing to head inside every few minutes as does a genuine food preparation area with worktops than you can wipe down easily. Of course, for the ultimate in outdoor catering an external refrigerator is an essential item - helping you to keep food fresh and your drinks cool, even on the hottest of summer days. 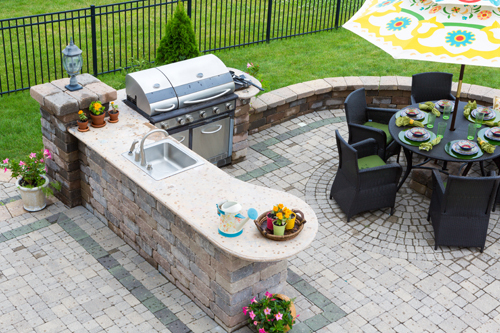 When considering an outdoor kitchen, try not to plan one immediately adjacent to your dining area. If space is limited, ensure you have a good chimney for your oven and barbecue so that diners are not covered in smoke if the wind blows in the wrong direction. One way of creating a sense of space in a chosen room of your garden is to do so with exterior lighting products. These come in just as many forms as internal lights do these days and modern lighting designers use them to create dramatic effects in many gardens. Lighting is a practical thing to have in an entertaining and dining area, but it can also create a sense of space. Opt for color-altering LED products like LED neon lights that create a dynamic feel but which can be relaxing nevertheless. Wall washes are great for providing subtle lighting touches which are superb at night, illuminating key architectural features and planting.